This section contains information related to FlyMe, flight code SH, a low-cost carrier original type. 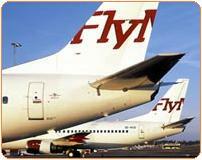 "FlyMe is Swedens low-cost carrier. They offer direct flights between Gothenburg and twelwe major European cities and vacation resorts. In addition to this, with Stockholm as its hub, FlyMe flies to Gothenburg and Malmö. Their goals are to have a good schedule and simple, rebookable tickets at lower prices than what our passengers are accustomed to. FlyMe operates flights since March 2004. They fly on the regularly scheduled routes Stockholm/Arlanda - Göteborg/Landvetter and Stockholm/Arlanda - Malmö/Sturup. On March 30, 2006, FlyMe started direct flights from Göteborg/Landvetter to 11 attractive destinations in Europe. The destinations are London/Stansted, Paris/Beauvais, Nice/Cote d'Azur, Amsterdam/Schiphol, Rome, Prague, Malaga, Alicante, Palma de Majorca, Rhodes and Crete/Chania. At June 4, 2006 FlyMe started the direct route Göteborg - Barcelona. FlyMe consists of Fly Me Europe AB, its B-shares are quoted on the Stockholm Stock Exchange’s Nya Marknaden (New Market), and the fully owned subsidiary FlyMe Sweden AB, which conducts all operational activities." FlyMe Sweden is fully owned by FlyMe Europe. Click to browse to the network development section of this site, featuring more more information on the network development of FlyMe.